Super Heroes, we’ve got them in ds106. 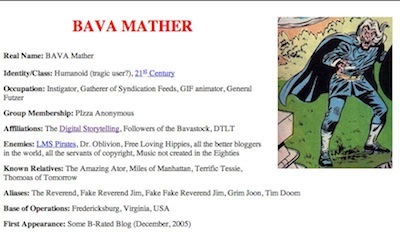 In digging the archives of bavatuedays, I recently came across Jim’s post on Cotton Mather, Marvel Supervillian? in which we see the source of his lovely blog icon. Ultimately, this leads to full profile bio of this dude, Cotton Mather. And so I dig back, and find that Marvel has a giant pedia of character profiles, and it occurs to me that it would be fun to do some web page rewriting of characters. To do this, I make use of an old school HTML technique. I save the source code of the Cotton Mather page as a local HTML file (in Chrome, it is File -> Save Page As and use “Web Page, HTML Only”. What I can do now is open this local HTML file (or upload it to my own server) and all of the content the original page uses (images, etc) will be available in my own copy- this is because the original HTML file references these files relative to its location on the server; our magic html above, makes our file act as if it is sitting besides the original. From here it is a matter of doing some HTML editing and re-edit the original content, which likely will send most people screaming into the night. I’m not here to give HTML tutorials, there’s tons of them out there. Select a profile of a Marvel comic character and rewrite the web page to build a super hero character our of someone involved in ds106. The easiest way to do this is to save the source of the web page as an html file, and either use the BASE HREF tag in the header for the root of the URL or to update the image links to be full URLs. Then rewrite the content to more match the persona you are satirizing. So who will you do as a profile? Don’t go looking for the Corn Dog dude.